You're working hard to steer clear of sugars, all of you Paleo and Whole 30 people, and you are doing great! You don't eat processed food. You haven't even had ice cream all summer (even on National Ice Cream Day!) You're eating meat like a caveman and feeling great. But did you know that there is a major unapproved ingredient lurking in the meat aisle? In a short perusal of sausages (both fresh and smoked) at a grocery store yesterday I saw corn syrup, dextrose and evaporated cane juice - all forms of sugar not acceptable on either Paleo or Whole 30 diets. Yes, almost all sausage has some form of sugar in it. It's part of what makes us all like sausage in a different way than say a burger or meatball which are also ground meat based. That salty and sweet thing that our human tongues seem to crave is all there in that casing (or patty if you will). 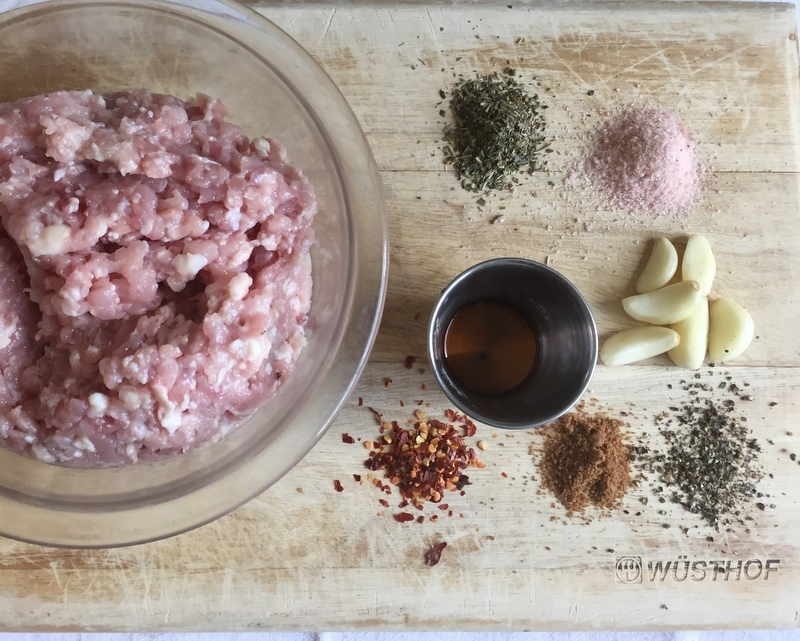 What if I told you it was super easy to make your own sausage with paleo and Whole 30 approved ingredients? Read on to find out how you can with no special equipment. Ok, I'm not talking about using pig entrails to actually form encased sausages. That's for much more ambitious hipsters who are wanting to prove a point. I'm simply wanting a "make your own" sausage to use in zucchini lasagna (like this one) or a patty of sausage to accompany my frittata (like this one) I'm talking about super juicy Breakfast Sausage, Italian Sausage and Chorizo so I can create a variety of cuisines. Because I am trying to use organic meats on a budget, I have begun to buy lesser cuts of meat and grind them myself in the grinder attachment for my Kitchen Aid. That's one extra step, so if you can find organic ground turkey, chicken or pork, feel free to use that. This recipe will work equally well with any of those. Also, if you are having to make budget concessions to do paleo or whole 30, use the best quality you can afford but avoid anything that doesn't at least say "no antiobiotics EVER" on the packaging if you possibly can. Regardless, I am not here to judge your choices, just to teach you how easy it is to make your own sausage, so let's get to it. If you are doing Whole 30 then you know that even maple syrup and coconut sugar are not allowed. Apples are Whole 30 approved, though, so use grated apples to give the sweetness if you are in the midst of that 30 days. Once you make your own sausage, I promise you will not want to go back to the store bought stuff. You can use lean ground turkey or chicken breast to keep the calories low while getting the protein or you can finely chop bacon and add it to the mix to bump up the juicy factor. One thing I found when looking for store bought sausage besides looking for those with no sugars was the fact that the varieties, especially of chicken-based sausages, were usually those that were meant to be stand-alone like spinach feta or mango habanero and not usable for my typical sausage engagements. While I have nothing against feta, spinach, habaneros, etc. they don't work in typical breakfasts, whether Mexican (like these Paleo Migas) or good 'ol biscuits and gravy so I prefer to make my own for the flexibility. In other words, it's a great way to get flavors you really like while sticking to your plan. You can make up several batches at once and freeze them for later so if you want to just have a sausage making day, start with the breakfast sausage recipe then divide up into how many flavors you want to create and add the additional seasonings to make the other flavors. Step One: Gather ingredients for your desired sausage flavor. I am doing Italian today and I did fail to put the toasted fennel seeds in this photo, but you can see them in the top image. Step Two: Mix everything together in a bowl. Step Four: Cook in bacon fat or avocado oil until brown and temp reaches 165 on the inside. Mix ground meat with all the seasonings and form into patties or stirfry and break up to use for lasagna, casseroles, etc. I use a large ice cream scoop to portion them out then shape into patties. One pound should make about 8 2-oz patties. If you have the time, let these chill for 2 or more hours (up to a day) to help them hold together better. Fry in bacon fat or avocado oil to keep it Paleo. Toast fennel by placing in a hot dry skillet and watching them til they turn golden. Remove immediately.